The ROUSH CleanTech Ford E-350 van is a versatile, alternative fuel vehicle to suit your fleet needs. Whether you need a cargo, passenger or extended passenger van, look no further than the Ford E-350 equipped with the 5.4-liter V8 engine. An economical workhorse, this van offers two different fuel tank size options, giving you plenty of driving time between fill ups. Find out why Ford E-series vans have been voted America’s favorite for decades. The ROUSH CleanTech liquid propane autogas fuel system is available for purchase and installation on Ford E-350 van configurations for 2012 and newer model years equipped with the 5.4L V8 engine. These retrofit systems can be installed at any one of our conveniently located ROUSH CleanTech authorized installation centers near you. ROUSH CleanTech offers two fuel tank options unique to the Ford E-350. The standard 25-gallon mid-ship fuel tank, which replaces the existing gasoline tank, gives your drivers plenty of range between refueling without sacrificing passenger capacity. Or, if you have a Ford E-350 wagon or extended wagon, you can choose the extended range tank with 46 usable gallons. This tank replaces the last row of seats in the van, giving drivers an estimated 450 miles or more between fill-ups. These Ford vehicles equipped with the ROUSH CleanTech propane fuel system offer a significant return on investment. Not only is propane 30 to 40 percent cheaper per gallon than gasoline, the clean-burning, domestic fuel these innovative vehicles utilize will provide extended service life and reduced maintenance costs. This means big bottom line savings for Ford E-350 owners like you. See the Savings Calculator. Not only does the Ford E-350 equipped with the ROUSH CleanTech propane fuel system provide exceptional comfort and ease of ownership, it maintains the same outstanding horsepower, torque and towing capacity as any other gasoline-powered Ford E-350 with a 5.4-liter V8 engine: 255 horsepower and 350 pounds of torque. This vehicle was designed and tested to perform in any altitude and extreme weather condition, so you can depend on a Ford E-350 propane autogas van to start and operate consistently and reliably. You don’t have to sacrifice performance in order to save money and go green. ROUSH CleanTech maintains the factory Ford 5-year / 60,000-mile limited powertrain warranty on vehicles equipped with the liquid propane autogas system. The ROUSH CleanTech propane autogas fuel system is covered by a limited 1-year / 12,000-mile warranty when installed on a van that is no longer covered by the Ford factory warranty. Propane autogas vehicles differ greatly from gasoline and diesel vehicles when it comes to maintenance. Since propane burns hotter and cleaner than gasoline or diesel, you get increased service life and reduced maintenance for your vehicle. The same experts who have developed Ford powertrain and calibration systems are installing ROUSH CleanTech propane injection systems, which means these vans can be serviced using standard Ford diagnostic equipment. 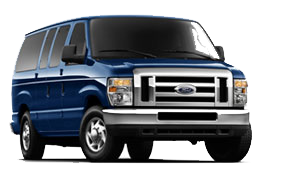 To keep your propane-autogas-powered Ford E-350 running its best overall, visit any conveniently located Ford service center near you for a periodic inspection of the tank and its attendant plumbing and pressure regulators that should be part of any routine maintenance process. Visit the Dealer Locator to locate a service center near you, or call . ROUSH CleanTech propane autogas fuel systems are one of the few that meet the stringent “SULEV” emissions standards set by the California Air Resources Board (CARB). Your customers will thank you for providing them with a more environmentally responsible option to deliver their goods or transport their passengers. The use of propane autogas in your fleet vehicles will earn your company a positive reputation because 90 percent of propane used in the U.S. is produced domestically. Therefore, by ‘greening’ your fleet, you’re not only cleaning up the environment, but taking a step toward reducing our country’s foreign dependence on oil, too.